I feel hot air balloons are such an interesting object, would I go up in one, I don’t know? They sure are fun to look at though. And they can be such a whimsical item to feature in a nursery. When I think of a hot air balloon, wishes come to mind. 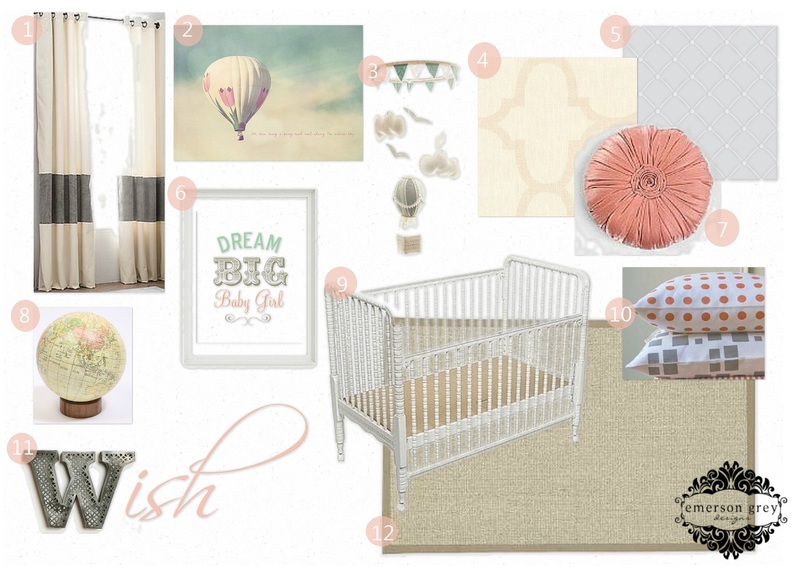 So this is my newest design board…enjoy! A coral and grey nursery can be such a calming palette when done in muted tones, a sisal rug adds a natural element while a Jenny Lind cribs adds tradition. Now, you may be wondering about the ‘wish’ on the board. The etched letter is from Urban Outfitters…I love them. And the ‘ish’ is an image I created to show how cute it could be to hand paint a script ‘ish’ right next to such a structured ‘W.’ It’s the juxtaposition of different textures and forms that add such character to a room. Thanks so much for adding my mobile! Such a great design board!